I've been reading blogs for over six years. As many of my favorite blogs are design and lifestyle blogs, I've read about many milestones in the lives of my favorite bloggers: first child, first house, death of a fur baby, and more. Through their words I've formed an idea of who I think they are. And my impression -- as well as yours -- may or may not be realistic. Whether we'll admit it or not, we form an opinion of what our favorite blogger is like from their blog posts, their Tweets, their Instagram photos, and so on. What we forget is most bloggers, myself included, don't share/post every challenge we encounter. Have you met bloggers who matched the impression you had of them? Have you met bloggers who were completely different? When I attend functions with other bloggers I'm always super nervous. Why? Two reasons. First, I'm usually interacting with women I admire, women who I may know intimate details about because I've been reading their blogs for awhile. And second, I'm afraid I won't live up to my online persona. I have this idea that I come across super polished, confident, always on top things, and able to say and do the right thing no matter what the circumstance. And, I don't want to come across as a fraud to someone I meet. When you visit The Road to The Good Life, I want you to feel a little better about the world and maybe brighten a bad day you might be having. So, I blog about the pretty not the mundane. I don't share/post every challenge I encounter. That means your first impression is being made from an incomplete set of data, data that you might think is complete because it could span years. As I enter a room filled with people I may or may not know, I always have to steel myself. My fight or flight response kicks into high gear, and all I want to do is hightail it to the hills. My first Alt Summit I almost didn't walk into the Hello Social that my roommate, Melissa of Lulu the Baker, was co-hosting at West Elm. Sure, I had left the Grand America Hotel, gotten on Trax, and arrived at West Elm. In most people's minds I had done the hard work. But until Melissa caught my eye, my feet stood cemented to the cold sidewalk. Once inside I struggled to exchange cards. I as ever so thankful the creatives at Alt Summit bring it with amazing business cards and that I had too--it gave us something to talk about (I'm the world's worst when it comes to small talk!). I was curious how far off my first impression might be. So, I took my blog (and a few others' blogs) and ran Typealyzer (tool no longer online as of 12/26/2015). (Typealyzer, created by Mattias Östmar of the research firm PRfekt, looks for certain words within a Web page and uses patterns from psychological research to map your frequent word choices to a Myers-Brigg Personality Type.) Now depending on what you write about, there's a high likelihood that your blog is more outgoing than you are. The personality type for this blog, The Road to The Good Life, is ESFP (Extrovert-Sensing-Feeling-Perceiving) - A Performer. That's pretty different from my actual Myers-Briggs Personality Type, an INTJ (Introverted, iNtuition, Thinking, Judging). When I've taken Myers-Briggs Personality Tests in a career counseling center setting (high school, undergraduate, and graduate), I've consistently tested Introverted (I) and Judging (J). The SF (Sensing-Feeling)/NT (iNtuition-Thinking) pair is always too close to give a preference one way or the other. Two other self-professed Introverts, Ez of Creature Comforts (site no longer online as of 12/26/2015) (Ez gave tips to fellow introverts about how to maneuver Alt Summit) and Melanie of Inward Facing Girl, also appear as Extroverts, ESTPs - The Doers, to be exact. Consider the type of interaction you're likely to have. If you're going to a speech or a book signing, you may only have a few seconds or so to connect. Know what you want. If you want to be a starstruck fan and have your photo taken with them, have your camera ready and ask. (If they say no it's ok, at least you asked.) If you want to collaborate with them, have a short elevator pitch and your business card with note about your idea on the back. Be authentic. If you know your favorite blogger(s) are speaking at a conference and you get tongue-tied, plan on saying thank you or giving a simple compliment. For example, I know Hilary Rushford is going to be speaking at Alt Winter this coming January, so I might say, "Hilary, thank you so much for hosting Style Me. Your Style Me October really helped me when my husband was in the hospital." Watch their body language. Just because you think you know them, double check that you're not coming across like a crazed stalker. If they're looking at their watch or scanning the room, or if you've accidentally pinned them in a corner, casually step back and gracefully end the conversation. For example, "I know you're busy, so I'll let you go. Thanks again for all you do; I really appreciate it." Be gracious. 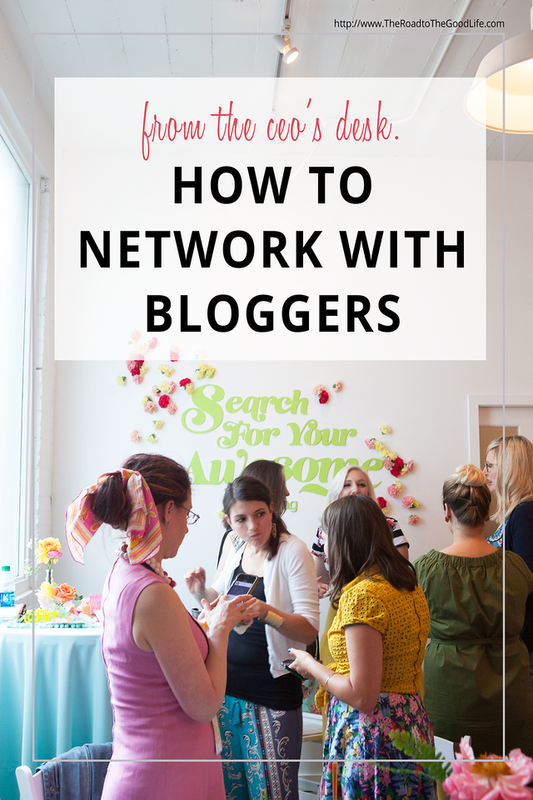 If you're a blogger too, someone may be seeking you out at an event you're attending. If they look like a deer caught in a headlight, throw them a life preserver, ask them how they're enjoying the conference. If you're rushing to get somewhere, let them know and give them the option to walk with you. Are you heading out to Alt Summit this month? Credits: All layouts designed by and most images taken by Eden Hensley Silverstein for The Road to the Good Life. Search for Your Awesome image taken by Brooke Dennis for Alt Summit and used with permission.